South Africa: Going Fast or Going Far? UN Security Council Chamber in New York City. A popular African proverb says, 'If you want to go fast, go alone. But if you want to go far, go together.' The proverb could describe the dynamics South Africa will encounter on the United Nations Security Council in the next two years. 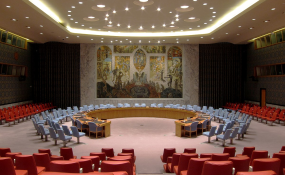 South Africa joined the Security Council on 1 January, at a time when the elected 10 council members (E10) have strengthened coordination to try to overcome deadlocks. These deadlocks originate from the stark divides among the five permanent members (P5) - China, France, Russia, the United Kingdom and the United States. The E10 have in recent years increasingly expressed the need for a more equitable division of labour and burden sharing. South Africa will now be able to engage with and support the E10 processes of enhancing coherence and coordination among non-permanent members. One key challenge for E10 members, and South Africa in particular, is managing the council's heavy agenda and workload, and the impact on the capacity of missions in New York amid escalating demands. Adding to this is the E10 members' role in the various Security Council subsidiary organs, including sanctions committees and other thematic working groups. E10 members traditionally chair these groups. While this could be seen as showing their relevance in dealing with contentious issues such as sanctions, for example in North Korea and South Sudan, it comes at the expense of administrative and human capacity in missions that are already overstretched. Many E10 members argue that in chairing sub-committees they should also be more active in drafting resolutions on related issues. This 'penholdership' role is mostly played by P5 members, particularly France and the UK. Permanent members have often used this role to drive language and direction in UNSC resolutions. They've also used it to control the time and length of negotiations. P5 members are not so keen to share their role as penholders. One of the few issues where the P5 currently seem united relates to maintaining their prominence on the Security Council. So it would take a lot of coordination among the E10 to provide meaningful contributions to resolutions. South Africa comes to the council with numerous key priorities identified during its campaign. These include conflicts in Africa such as in the Democratic Republic of the Congo (DRC), South Sudan and Somalia. Thematic areas include the role of UN-African Union (AU) relations; women, peace and security; and the role of mediation in conflict prevention efforts. To be influential in these areas, South Africa will have to work with traditional penholders - for example France on the DRC, and the UK on Somalia. Partnering with these countries will ensure that the country is well positioned to present its priorities timeously for inclusion in Security Council resolutions. Time to negotiate council resolutions is often restricted. South Africa will need to ensure that its internal systems are well placed for its experts in New York to respond quickly, and to effectively promote its priorities in resolutions. Whereas P5 members are largely unaccountable to others and can afford to pursue specific national agendas, the E10 serve a much larger function. They are mandated and elected by the UN General Assembly as its representatives to the council. Since the three African members on the council (A3) are also endorsed by the AU, South Africa could play an important role in the A3. Helping increase coordination among the A3 could strengthen the African voice, urge joint negotiations, and enhance its accountability to the broader African membership. Experts in New York share the idea that most council members, including countries like Russia and China, will seldom object when presented with a united African position. South Africa's role in working groups and subsidiary organs is also important, despite the challenges of a heavy workload. The country will have an important opportunity to chair the ad hoc working group on conflict prevention and resolution in Africa that needs revitalisation. South Africa has the chance to show that E10 countries can use existing structures to shape more constructive and successful discussions. The ad hoc working group could for example focus on receiving timely briefings by the UN Secretariat on emerging crises in specific regions. It could bring together experts to brief the council, and establish a space for early discussions. South Africa will probably return to the AU Peace and Security Council in February for a three-year term, after having stepped down in January 2018. Being on both councils will provide a key entry point for coordination between them. 'South Africa's ability to shape things through E10 partnerships, including through its roles in subsidiary organs, will largely depend on how well the country can lead on substance in the drafting and reviewing of resolutions,' says ISS executive director Anton du Plessis. South Africa's two years on the council could be seen as an individual sprint, if pursued with little coordination among members. But if the country really wants to go far, it should collaborate and use teamwork to play a constructive role.